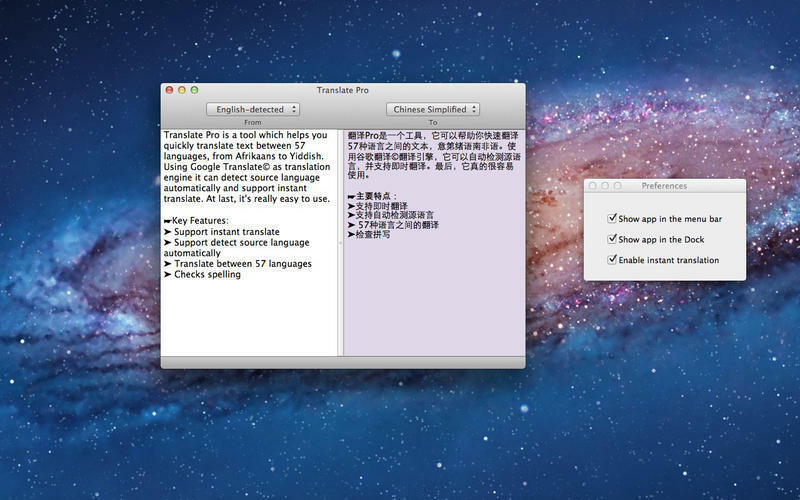 Quickly translate text between 57 languages. Is there a better alternative to Translate Pro? Is Translate Pro really the best app in Language category? Will Translate Pro work good on macOS 10.13.4? Translate Pro is a tool which helps you quickly translate text between 57 languages, from Afrikaans to Yiddish. Using Google Translate© as translation engine it can detect source language automatically and support instant translate. At last, it's really easy to use. Note: An Internet connection is needed for Translate Pro to retrieve translations. Translate Pro needs a review. Be the first to review this app and get the discussion started! Translate Pro needs a rating. Be the first to rate this app and get the discussion started!